The official Bellator 26 Main Event Card is unleashed. Bellator Fighting Championship has announced the final card for Bellator 26 event. The card contains eight total contests. 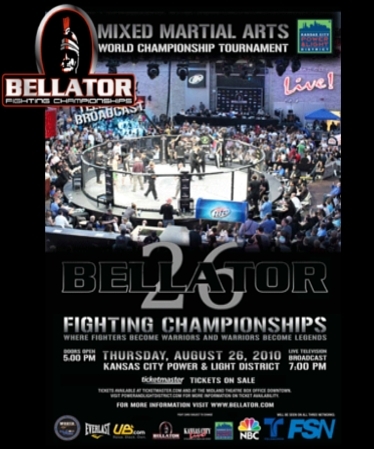 The event will take place on August 26 at Kansas City Power and Light District and airs on FOX Sports Net. The official list of fights are as follows: Mike Hayes vs. Alexey Oleinik (heavyweight tournament bout), Aisling Daly vs. Lisa Ward (115-pound female tourney bout) on the main card, and Rudy Bears vs. Zak Cummings, Kevin Croom vs. Brian Davidson, Brian Imes vs. John Ott and Jeb Chiles vs. Demetrius Richards for the evening’s untelevised “local feature” fights. Hayes (12-3-1 MMA, 1-0 BFC) fought 8 times alone in 2009. He has a recent four-win streak with unanimous decision win over Steven Banks at bellator 21. He was expected to fight South Korean fighter Hae Joon Yang (5-0 MMA, 0-0 BFC), but Oleinik (27-5-1 MMA, 0-0 BFC) ultimately took the slot. Oleinik’s record includes submissions, bulldog chokes, heel hooks, a scarf-hold armlock and an inverted armbar also dot his resume. Daly (9-0 MMA, 0-0 BFC) made her Bellator debut with nine straight wins in Europe. Only her most recent fight Maiju Kujala went to trance. She’ll put her record in line with Ward (13-5 MMA, 1-0 BFC) a 6 yeat veteran who topped Stephanie Frausto at Bellator 22 in June. Bears (11-5 MMA, 1-1 BFC) is fighting for the third time under the Bellator banner. On the other hand, Cummings (10-2 MMA, 0-0 BFC) is making his Bellator debut. Cummings made waves in Feb 2009 with split decision win over Terry Martin. Croom (1-1 MMA, 0-0 BFC) makes his promotional debut. Croom lost his debut to Bellator bantamweight tourney fighter Jose Vegas in a February 2009 but got it back via submission in November. Finally, Chiles (5-1 MMA, 0-0 BFC) makes his organizational debut versus Richards (5-4 MMA, 0-1 BFC), who is asking his first Bellator win.